I think I will also use the ignore function. I was of the opinion we had all moved on from this weather event in terms of arguing about how truly exceptional it has indeed been, with an estimated 500,000 head of cattle lost I think the facts speak for themselves! Other than that quick post, I am staying out of it. What I am not staying out of is wishing this storm season would stop sucking so badly. All the rain from the recent big monsoonal burst didn't occur until very late January and was split between late Jan/early Feb so using calendar months to analyse the significance of a single event that overlaps two months isn't going to be truly representative of the intensity and areal extent of the event itself, especially if the areas concerned shifted a bit during the event, or if rainfall before or after it was low. You have to compare apples with apples i.e. compare the event's rainfall with what's typical for that same time period. It wasn't just "some" locations either - if you looked at the maps for daily rainfall percentiles and average recurrence intervals posted around a week ago, you'll see the areal extent of the 99th percentile or greater rainfall day after day which included a large chunk of NW QLD and the northern interior. For example, the Flinders River is a big river which runs through NW QLD and its catchment area lies outside the Townsville region... yet, it's been experiencing its most significant flood in at least half a century to the point that record floodwaters have also been breaking out into surrounding catchments. As is often the case, the bigger population centres such as Townsville usually tend to get the most media attention because of the impacts and also partly due to the heavier concentration of social media footage from there while more sparsely populated areas get less, even when there is a significant event there as well. Also, there's more to the strength of a monsoon than just how much rain it drops although naturally a strong monsoon will typically cause heavy rain - the crux of a monsoon is a seasonal reversal in winds. In the case of the most recent monsoonal event (and I'm referring to it as an event in this example to differentiate it from the rest of the season before and after it), the monsoonal west to northwesterlies feeding into the northern side of the monsoon trough and low were strong (bordering on gales at times) which is classic of a very vigorous monsoonal event and hence the repeated severe weather warnings for abnormally high tides along the windward facing coastline of the Gulf - wind anomalies from the 26th Jan to 9th Feb above. It's something that's often forgotten about in all the talk about the rain. While the low was the main talking point of the event, it wasn't the only aspect of it. Another thing that's easily overlooked is the fact that rainfall anomalies associated with strong monsoonal events aren't just restricted to land where people live. Satellite precipitation monitoring indicates greater than normal rainfall overall over waters surrounding far northern Australia over the last 30 days, a proportion of which was likely to have been from the recent burst. I think the sticking point all along has been what criteria you use to judge whether a monsoon is strong or not, and whether you're referring to the monsoon as in the context of the most recent event itself. If it's the latter, then it was remarkable not just in terms of Townsville rain but also other large parts of QLD's northwest and northern interior as well as for the strength of the monsoonal flow to its north. On a more relevant note to this thread, I think this serves as another good reminder that while monsoon lows and trough sometimes do make it down here, a large proportion of the time they don't, even when they're strong. Re the Coral Sea system that the deterministic version of EC's trying to bring in towards the end of its forecast period - currently 10% of its ensemble's members are producing any decent wind and rain from it for Brisbane while 90% aren't. Thanks Ken - certainly was an exceptional monsoon event. If Townsville had been the only area affected than one could argue that the event was only exceptional in that it stalled allowing one locality to get a huge dump of rain. But as has become clear vast areas of north-west Queensland received significant rain and wind. This didn't become apparent in the media until toward the very end of the event. The monsoon event was exceptional because it stalled, focused huge falls on a small area, but still also delivered significant falls to a wider region as well. As Ken mentioned there were other impacts too that suggest a powerful monsoonal event. I think it would be incredible if that same monsoon low came back onto SEQ as a TC or ex-TC. That would instantly make up for this terrible season. EC still has it lurking off SEQ, GFS now has it striking SEQ as a smaller low flung onto the coast by the Fujiwara effect, GFS FV3 has a major cyclone impact on Rockhampton and Access-G has it rotting out near New Cal. Re: Townsville. Not only was the prolonged stall exceptional, but also the conditions just before the peak on the Sunday 3 Feb around late morning to early afternoon. I posted a link to the precipitable water analysis product for 10am on the Sunday, that concentration of preciptitable water particularly off-shore and near coast on the Sunday was extraordinary IMO. God only knows what sort of rainfall totals may have landed on the ocean. Looks like a nice cool change comes through here after tomorrow with temps below 30 degrees for a few days. Nice breeze expected too. Lows will dip a bit below average also. Hope everyone enjoys the cool break! Not something that happens routinely in these numbers even after taking into account any changes in their distribution and numbers over time and prior drought stress. “ The chief executive officer of AgForce, the peak body for the Queensland cattle industry, Michael Guerin, said farmers could take decades to recover. Soooo good to see you back Ken!! Ken has already posted something similar but here’s another view of the North West Qld flood extent. This one has scale bar and the property boundaries shown. Mind blowing really. I am waiting for someone to rage against my harping on the drought that is slowly but surely chocking northern NSW and Southern QLD. Apart from the fortunate SE QLD coast probably record rain deficiencies are developing for the last 4 months even right to the coast now in NE NSW. It seems to have been forgotten at the moment, but it will become stark reality when this month ends. Of course, I am hoping some big rain event happens soon. If not, someone may think, "that whinging jerk NSPete was right. But I hope I am totally wrong. Well it would be nice to have a better time period to show maps for, but I don't so the monthly will have to do. I think it still gives a pretty good indication of where the very heavy falls were. No idea where this map is and couldn't find it. So how do the winds stack up to other monsoon events. Many other monsoon events include cyclones and this one didn't, so I'd be pretty sure the peak wind speed at a location in this event was low to average. Of course the average over a wide area would be more relevant. My perception is that this was probably stronger than the average burst, but not truly exceptional. In particular the area and intensity of strong wind seems to have grown significantly as the monsoon burst has moved on into the western Pacific. I don't remember there being any area of red on the map while the monsoon was north of Australia? Does anyone happen to have an equivalent map lieing around in case my memory is faulty? Also look at the precipitable water as posted by flowin. See how there is more precipitable water well out in the Pacific near the dateline than over NE Australia. This reflects a modoki/el nino like state with more water out near the dateline, in contrast to true neutral/La Nina which would have more water over Australia, and trades pushing all that Pacific moisture towards the continent. I just can't see how the monsoon on a large scale can be exceptional when such a large proportion of the available energy is diverted well out in the Pacific. I think the sticking point all along has been what criteria you use to judge whether a monsoon is strong or not, and whether you're referring to the monsoon as in the context of the most recent event itself. I am thinking of the monsoon in terms of general amount of uplift, convergence and moisture over North Australia. 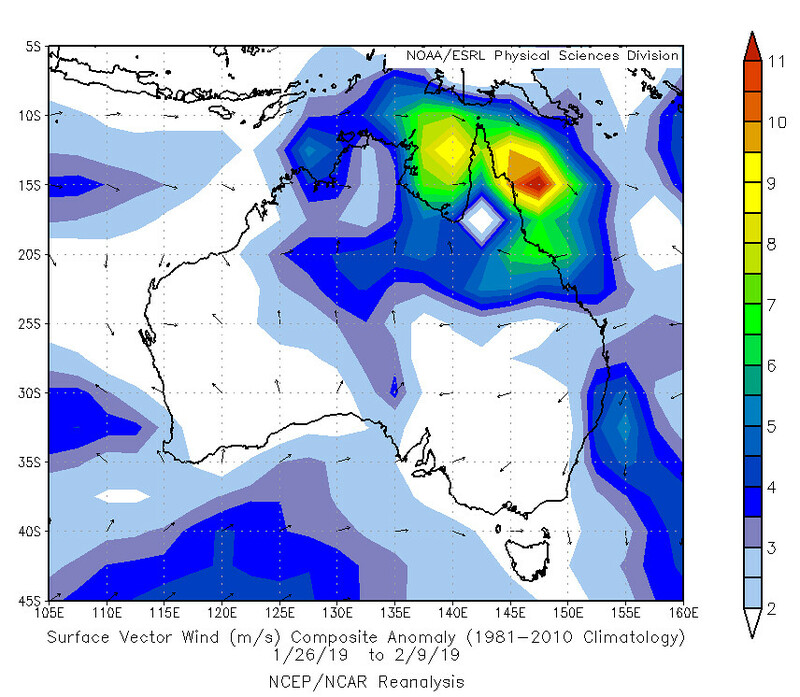 This relates to ENSO and MJO status and other climate drivers, and large amounts of such activity over Northern Australia are more likely to generate flow on effects to the southern parts through Rosby waves (not sure how it works, but thats what the research claims), being a key aspect of how ENSO/IOD status impact southern Australia rainfall. A final method of measuring the monsoon is through the strength of the MJO. Not ideal, but at least it is relatively objective. This suggests a solid monsoon event, but far from exceptional. Mike, please drop it, or go to the climate thread. I do like most of your posts but like many, I have seen enough about this topic. Also, you have distracted from my brilliant post. Does it really matter if one calls it exceptional or not exceptional? It provided above average rain for a lot of areas and lots or records were broken. Let the people in the middle of north western Queensland tell you what they think about this latest monsoon. I can guarantee they won’t consider it a normal run of the mill monsoon, that’s for sure. Geez, Mike you need to let it go. Strength of MJO as a method of measuring Monsoon really?. There were many consecutive days of large areas of rain above 97th percentile and significant areas above 99th percentile. Also, you have distracted from my brilliant post. Yes your post was good and very pertinent topic for our region right now and into the immediate future. Thanks, flowin. I put that in because I have seen It happen(though rare) to others. I'm sure it doesn't matter to a lot of people. I don't think that stop those who think it is interesting from discussing it, as long as the discussions are polite and fact based. No Pete they may seem to be forgotten SEQ and Northern NSW due all the attention centered on what has happened up North but the SEQ is under a severe fire watch. You would have seen a big difference in just the 2 years or more that you have moved to Toowoomba. The dams up Toowoomba way must be getting low again. They really need to build another dam but I am not sure where they could. Toowoomba has gone from a country town to a city. It is a very big place now. Issued at 4:58 am EST on Wednesday 13 February 2019. Hot and dry conditions combined with freshening west to southwesterly winds will lead to severe to locally extreme fire dangers across forested areas of the Maranoa, Darling Downs & Granite Belt, southeastern Central West and southwestern Central Highlands and Coalfields districts today. Monitor the fire and weather situation through your local radio station, www.ruralfire.qld.gov.au and www.bom.gov.au. No further warnings will be issued for this event, but the situation will continue to be monitored and further warnings issued if necessary. I'm right with you there, we've had 4 inches over the last week which is very welcome indeed, but there is not much moisture past the surface. I've got my fingers crossed that the end of this month/March will bring some more rain but I'm also prepared for another sub par start to a dry winter. The rain here has been getting increasingly unreliable and sporadic over the last few years. 6 registered (crikey, Lee@Hazo, AndrewM, Ben K, 2 invisible), 70 Guests and 3 Spiders online. Generated in 0.029 seconds in which 0.014 seconds were spent on a total of 13 queries. Zlib compression disabled.